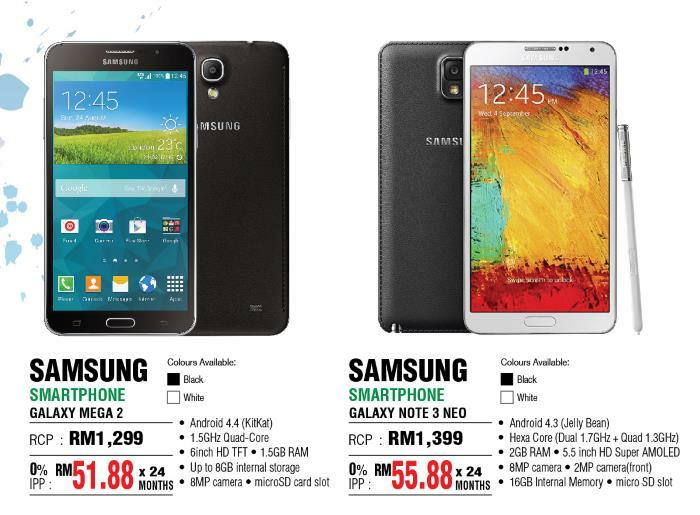 Samsung Galaxy Mega 2 has been spotted on a number of occasions in the past few weeks. The device passed through the FCC a few days back, and now we have some more information about the handset. It seems the gigantic Samsung Galaxy Mega 2 is already up for sale in Malaysia for RM1,299 (almost $410), as well as an easy instalment plan for 24 months. The phablet was listed online by an authorized retailer Sengheng, who is selling the phablet in the Malaysian market, at a reasonable price. As for the specifications, the alleged device is said to come with a 6-inch HD display with a quad-core processor clocked at 1.5GHz with 1.5GB of RAM and 8GB internal storage, coupled with a microSD card slot. There’s an 8MP camera on board for photos and videos, and runs Android 4.4 KitKAt as its operating system out of the box. The device is available in two color options: black and white. The specifications listed at the promotion are quite different from the ones revealed by the rumor mill in the past few days. Rumors hinted at a 12MP camera and 2GB of RAM, but it turns out that’s not the case — the features are not as high as the rumor mill predicted. There’s no word if it’s available in any other country, we’ll update you as soon as it launches in other markets.